We are a Vampyrian or Vampire Otherkin Temple of Real spiritual Vampyres or Vampires for Divinity, unity, support, and strength. The whole purpose is to unite and educate the Vampire community on its abilities, capabilities, beginnings as well as focus on the spirituality of Vampyrism. 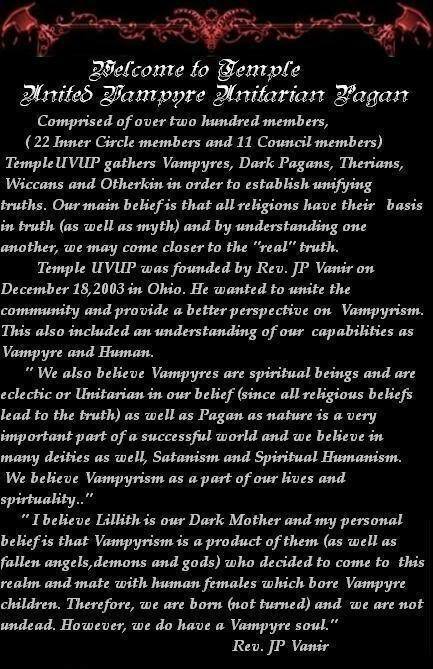 We are a our own United Vampyrian Universal (eclectic) Pagan Temple in Ohio founded Dec. 18, 2003 (back when yahoo groups where popular). Our belief is all religions have there basis in truth just what people understand and by trying to understand each other we may come closer to the real truth. 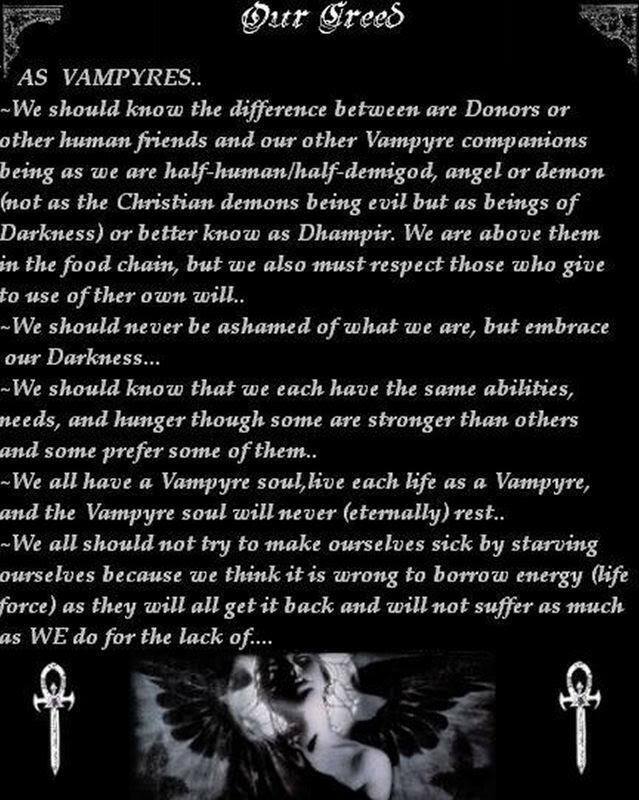 We generally are a Dark Goth Pagan Universal Vampyrian Temple and not everyone has to agree with that but we are an open minded Temple and hope you will be open minded too. I hope we can each share our own personal beliefs here and be OK with that. Take in what you wish and ignore what you wish; the main place to post long posts is: *MAIN place for most of our Information and add a page and our forum is HERE. Many modern day vampyres such as myself chose the different spelling to create a class of their own. As “vampyres” we are set apart from the fictional creatures and established as something quite separate. Vampyres are those which I’ve described many times before, the ones who need the energy of others to keep themselves both healthy and sane, but we are nothing like the vampires you’ll read about in horror stories or fairy tales. In short, the changing from “i” to “y” merely separates modern day vampyres from fictional vampires so that there is finally some distinction. ***DISCLAIMER FROM REV. JP VANIR: The purpose of this site is to provide information to our members; The posts are the beliefs of many different people and there beliefs. As such, the views and attitudes contained in the posts are entirely those of the author(s), and may not necessarily be shared by Rev. JP Vanir unless stated as such. The webmaster is not under obligation to update or otherwise keep current the contents of this article. Most importantly, only you can decide for yourself whether this article or any of the author(s) other views are useful or applicable to you – use your own reasoning and judgment. I will not be held responsible for the information a member posts in the forum as I did not write it and it was not me who posted it in the forums, blogs, or personal profiles. If you think your stuff has been stolen please go to the person who posted it on the site (not the site owners). All Vampyrian posts are written by © Vampyrian Rev. J P VanirALSO: Unless I put © Vampyrian Rev. J P Vanir I am NOT claiming that I wrote my posts on the site/network. We are a ECLECTIC (Universal) Temple and not everything here is my personal beliefs. I am a THEOLOGIAN first and want my Temple to be open to know about ALL possible beliefs/religions/spirituality’s. I DO NOT know it all but wish to teach what I have researched over the many years.